The Bump Diary: Week 34. It’s been 8 weeks since my last bump update, and which is a testament to how life seems to be flying by lately. Part of me feels like I’ve been pregnant forever. I look down at that app on my phone and see the days count down though (oh gosh, five weeks and a few days to go!) and I’m absolutely amazed at how time is passing by so quickly in this stage. And with that, a few updates! What I’m feeling: Well, besides big and tired, I’m feeling a bit of denial right now. I catch a glimpse of my reflection sometimes as I pass by a mirror or window and have to do a double take — who is that girl with her giant bump and what does she think she’s doing? Is this really happening? The little Rockette kicks tapping on my insides right now assure me that yes, this is definitely happening, but it still feels surreal even as we’re getting so much closer to the due date. At the same time I was feeling some bouts of panic right before Thanksgiving because it seems like we’re running out of time and I had so many things that still needed to be done. In the past few weeks though we took a birthing class and toured the hospital, my mom helped me tackle a few items on my hospital bag packing list so I could get that wrapped up, and we’ve spent some time getting the nursery set. Seeing the nursery assembled is a little jolt of reality every time I walk by and see that there’s a crib in our house! It’s just about finished, short of a few last accessories and details. I’ve been assured though that you can, in fact, have a baby without artwork hung on the walls or decorative bins on the shelves. Phew! What I’m wearing: I have gotten this pregnancy uniform down to a science and pluck a black dress or t-shirt out of my closet most days, pair them with dark jeans or leggings, and slip into my comfortable booties. Pregnancy has made me realize the appeal of capsule wardrobes — fewer options that easily mix and match make for the easiest dressing experience (minus not being able to tie my shoes and all). I think it’s a valuable lesson I need to carry into my post-pregnancy wardrobe! Outside of those staples, I’ve added in some really cozy sweaters from Old Navy, a trendy top that I’ve worn on repeat to holiday parties and blogger events with a black blazer and leggings, and borrowed a hand-me-down maternity coat from one of my girlfriends to keep my bump warm. What I’m eating: I’m a full-fledged cookie monster. I want a gooey soft chocolate chip cookie every chance I can get, and have been breaking off a few pre-made Pillsbury cookie dough bites and baking them off after dinner more often than I should admit. Other than that sweet treat, I’m still on a big Indian food kick. Sweet and spicy are my pregnancy flavors! What I’m drinking: I thought not drinking over the summer was hard, but man does it stink not have to a cocktail at the holidays! I’m missing bubbly prosecco and bloody marys like whoa. It’s nowhere near as fun as festive mixed drink, but I’ve been having a Pink Grapefruit Perrier everyday to mix up my water intake. What I’m loving: I made a big list of things I wanted to buy for Baby B on Black Friday and unleashed a bit of a shopping spree buying cute clothes and shoes. 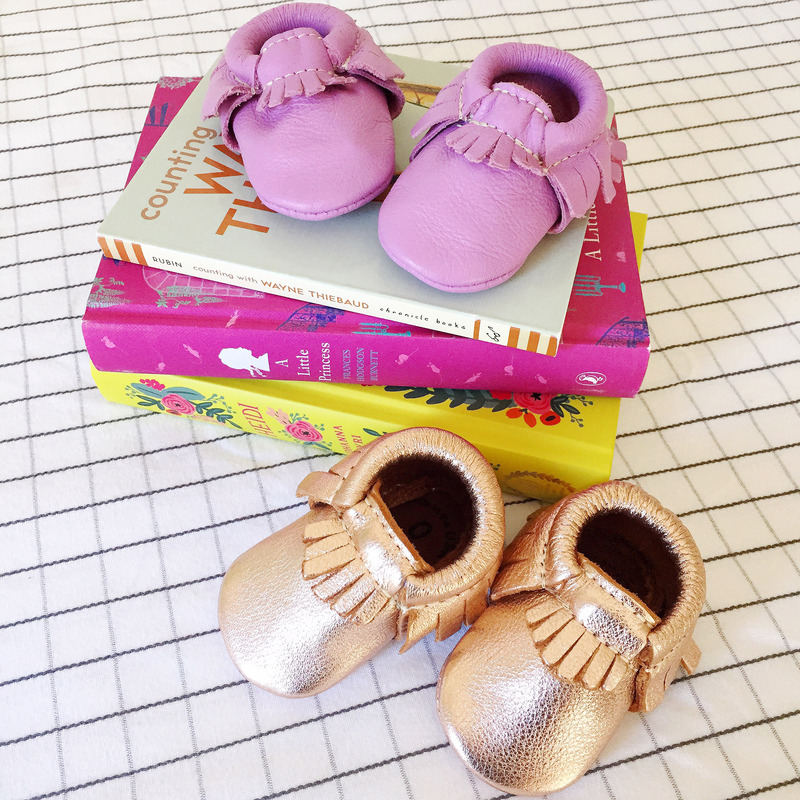 The moccasins from Freshly Picked are so cute, I squeal every time I see them. I also bought a ton of things from June and January, and can’t wait to mix and match our little gal in these bright colors! Another thing I’ve been loving is playing around with all of the cute books and toys we got from our baby shower and styling the shelves in the nursery. I’m so lucky that I have friends and family with amazing taste — there is some seriously cute stuff to play with. What’s next: My goal for the next 5-ish weeks is to give myself a bit of a break. I made a giant to-do list of things that I want to get done around the house, but I know that realistically they won’t happen. Instead I know I need to enjoy some down time with my husband and family, soak in the holidays, and try my best to get rested before this next phase starts. We’ll see if I make it to another bump-update before Baby B arrives! Stocking Your Holiday Bar Cart. Holiday Gift Guide: Book-Themed Gift Ideas.